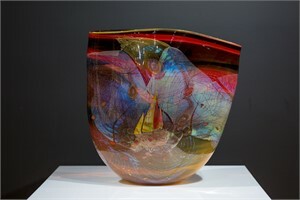 Working out of his studio in Oregon, Chris Hawthorne has become internationally recognized for his large and colorful, loosely-handled blown glass artwork. His casually elegant forms exemplify masterful skill. He would never tell you this himself, Chris is not one to toot his own horn, but Chris is one of the most relevant and sought after glass artists in the United States today. His work continues to go up in value and is part many notable collections. Some of these are the Museum of Fine Art in Boston, The Muskgon Art Museum, Dow Chemical, Motorola Corporation, Prudential Securities, Peat Marwick, and Gilllette Corporation. It is an honor to represent him. 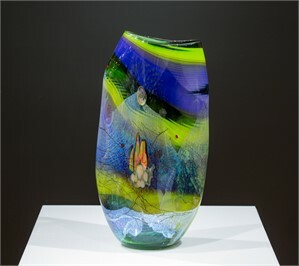 Dale was born in Detroit Michigan in 1953, and relocated to Oregon to make his way in the glass world. He met Dale Chihuly through a mutual friend, and Dale invited him to further explore the medium. They worked together in the hot shop and they mastered their skills. Chris continued studying at Pilchuk from 1978-1991. Chris's teachers included Dan Dailey, Marvin Lipofsky, Fritz Dreisbach and most importantly Lino Tagliapetra (considered by most to be the best in the world!). 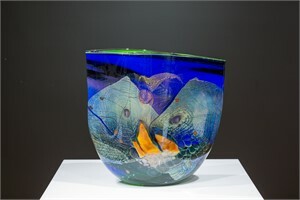 They all supported his efforts to develop a colorful and painterly approach to glass sculpture. His work is significantly influenced by Pino Signoretta, master glass blower and sculptor from Italy, and the ever fluid William Morris. In 1985 Chris built his own hotshop and gallery in the Pacific North West, and shares the space with his artistic wife Julie and their talented children. 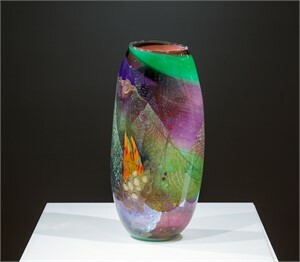 Working out of his studio in Oregon, Chris Hawthorne has become internationally recognized for his large and colorful, loosely-handled blown glass artwork. His casually elegant forms exemplify masterful skill. He would never tell you this himself, Chris is not one to toot his own horn, but Chris is one of the most relevant and sought after glass artists in the United States today. His work continues to go up in value and is part many notable collections. Some of these are the Museum of Fine Art in Boston, The Muskgon Art Museum, Dow Chemical, Motorola Corporation, Prudential Securities, Peat Marwick, and Gilllette Corporation. It is an honor to represent him. 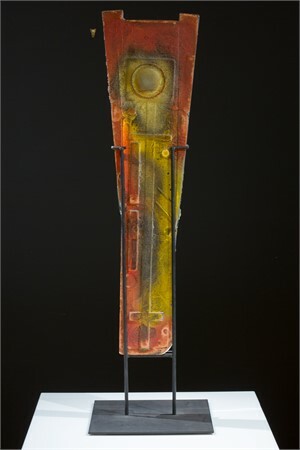 Dale was born in Detroit Michigan in 1953, and relocated to Oregon to make his way in the glass world. 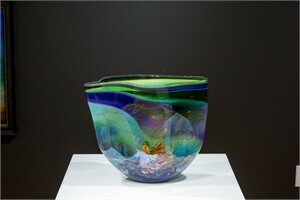 He met Dale Chihuly through a mutual friend, and Dale invited him to further explore the medium. They worked together in the hot shop and they mastered their skills. Chris continued studying at Pilchuk from 1978-1991. Chris's teachers included Dan Dailey, Marvin Lipofsky, Fritz Dreisbach and most importantly Lino Tagliapetra (considered by most to be the best in the world!). 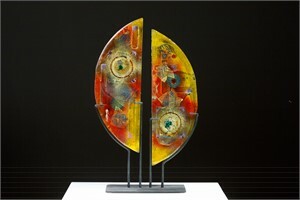 They all supported his efforts to develop a colorful and painterly approach to glass sculpture. His work is significantly influenced by Pino Signoretta, master glass blower and sculptor from Italy, and the ever fluid William Morris. In 1985 Chris built his own hotshop and gallery in the Pacific North West, and shares the space with his artistic wife Julie and their talented children.